This is a movie version of the Tim McGraw song "Live like you were dyin'." I love that song and like this film! Both remind us that life is a limited engagement. It doesn't matter if you're sick, healthy, young, old - we are all gonna kick the bucket one of these days. Are you letting the years roll away without getting the most out of them? Are you waiting to die before you think of living? There's one scene early on where Jack Nicholson insists he can scoot himself from the gurney to the bed and consequently falls in between. It's a cheap site gag, predictable, dumb. I did not like it. That is the only thing I didn't like about this film. 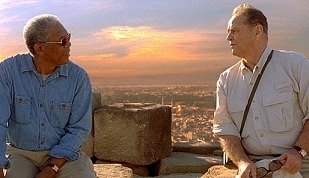 Completely engaging, always endearing, Nicholson is a blast and the script is full of strong meaningful dialogue that entertains without falling prey to clich�. Warm, fuzzy, emotional, with some truly funny comedy woven in. Yes it's a bit syrupy � but you only live once and I like lots of syrup with my pancakes. Butter too, but that doesn't so nicely fit the metaphor. Blueberry's too � just for the record. (Oh yeah, and besides the McGraw song, the film is also reminiscent of the book The Little Snail Story.) May you all laugh so hard you cry. The Bucket List. Copyright © 2007. 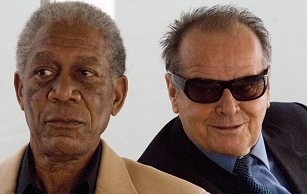 Starring Jack Nicholson, Morgan Freeman, Sean Hayes, Rob Morrow, Beverly Todd. Produced by Alan Greisman, Rob Reiner, Craig Zadan, Neil Meron at Warner Bros.